“What do you expect? 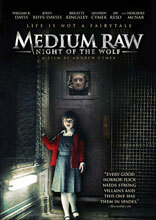 You’re cooking half my staff for dinner!” â Jamie (Brigitte Kingsley) in Medium Raw: Night of the Wolf. If you are excited about the fact that John Rhys-Davies is in Medium Raw: Night of the Wolf, you are going to be disappointed as he’s in the film for about two seconds before getting dispatched. Still, since he is actually in the movie, why not put him on the cover and promote him as one of the stars, right? Actually they should have given more props to the Cigarette Smoking Man (William B. Davis) from The X-Files since he’s actually in the film for the duration. This set up plays a bit into what Medium Raw really is about as it is more a tale of a bunch of people trapped inside an insane asylum after the power goes out and all the loonies get released including the supposed killer of these children â the serial killer known as the wolf. There’s a dude with a foot fetishâ¦like literally, he collects toes and feet. There’s a ginormous dude that goes postal when he sees red (and when the lights go out the emergence lights are red). There’s a cannibal that is the Martha Stewart of cooking human flesh. A dude that enjoys ripping off the faces of people and sticking them on his face Hannibal Lecter style. And this doesn’t include the wolf that dresses completely in metallic garb with an augmented bear trap for a helmet and Wolverine style blades for claws. With all these crazies running about, it doesn’t look to good for the civilians inside and the two cops also trapped within. But with a decent twist about the wolf, some amusing dark humor and a more than obvious nod to the Little Red Riding Hood tale, it doesn’t become just a run-of-the-mill splatterfest. One really bad part of the entire film is the acting of Cymek. Not sure why he decided to put himself in the lead role outside of ego, but he’s terrible. Talk about a dry delivery. I’ve seen more emotion from a paper bag. His performance is ridiculously laughable. It’s too bad actually because most of the other performances aren’t half bad. Hell, even pro wrestler Jason Reso (who goes by Christian in the WWE) is better than Cymek. That’s really bad when you are upstaged by a pro wrestler. Despite this, not that bad of a flick and worth checking out if you don’t have anything else in your Netflix queue.